The cold weather is moving in and thoughts of a good soup or stew wets the taste buds. 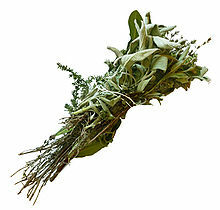 Your choice of herbs for the bouquet garni, a must for seasoning, depends on the type of stock you have. Chicken or fish require the more delicate flavored herbs, while the more robust herbs can be used with beef stock. The classic bouquet garni consists of 2 sprigs of parsley, 1 sprig of thyme and a bay leaf. Originally it was thought the herbs would be compatible to the terrain on which the animal or bird had grazed thus the addition of such things as juniper berries, sage, or rosemary. Okay, so let’s consider the classic combination. BayLeaf, to the Greeks, a sacred tree. In Rome, an emblem of glory, and to the English, an antidote to witchcraft. Parsley comes from the Greek word “petro" meaning rock or stone and is thought to bring good luck if planted along your garden and bad luck if planted across. And thyme, the symbol of courage and of elegance and of extreme republicanism. Maybe what all this means is you have a clump of herbs that is republican, has good luck and can scare away witches! If this is not to your liking, follow your own instinct in gathering herbs you think most suitable or that pleases you for a particular dish. Some interesting additions would be Chives, Lemon Balm, Marjoram, Sage, Rosemary, Savory, Mint or Oregano. Basil can be included for tomato dishes. butter, 4 tbsp. flour, 1-1/2 cups milk. onions in buttered casserole dish.